KIOTI Tractor set the bar high last year with the launch of its high-performance RX6010C, a durable 59-horsepower utility tractor. However, with the introduction of its new RX6010PC model earlier this month, the company raised the bar even higher. The new KIOTI RX6010PC model tractor boasts a hydraulic shuttle transmission versus the synchro shuttle transmission offered on the RX6010C. The hydraulic shuttle provides the operator with the ability to change direction with the quick flip of a Power Shuttle Lever, eliminating the need to stop the tractor and step on the clutch to change direction. Continuous operation increases efficiency and delivers greater productivity when using the KIOTI RX6010PC. The tractor is equipped with a wet multi-plate clutch system to support the intended rigorous and continuous use of the tractor. In addition to the ability to change direction with the push of a lever, the RX6010PC delivers an easier-to-handle loader experience. The telescoping Category II three-point hitch, which can be controlled directly from the operator’s station with a single-lever joystick, provides 3,710 pounds of lifting power, 24″ aft of hitch. Standard quick-attach dual remotes are located near the three-point hitch. Mid-mounted hydraulic remotes are also standard for running front-end tools. The RX6010PC houses a 59-horsepower turbocharged Daedong diesel engine that is both powerful and fuel-efficient. 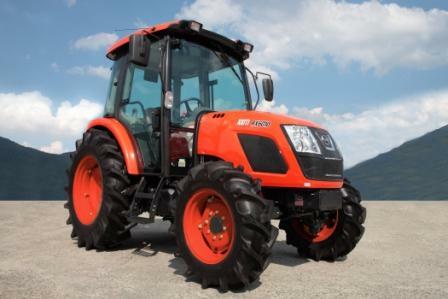 KIOTI’s parent company, Daedong Industrial Company, Ltd., designs and builds its own engines, as well the other major components and systems on all KIOTI tractors, a practice the company has branded “The Power of 1″ manufacturing process. Manufacturing in this manner results in a better fit and finish, and optimal operating efficiencies on every KIOTI tractor built. On top of the 59-horsepower provided by the Daedong diesel engine, an additional 49.1-horsepower at 540 RPM is supplied by the standard independent rear PTO, giving the RX6010PC the ability to run a wide range of implements and attachments. The RX6010PC’s front-end and hood design offers a one-touch control release to simplify and speed up routine service and maintenance. A deluxe cab with a wide-range of comfort features is standard. A flat deck provides a productive work environment which is enhanced by amenities like an AM/FM stereo with CD player, cup holders and a 12-volt power outlet for plug-ins. The 12-speed transmission allows for travel up to 19 mph in either forward or reverse. Additional standard features include an adjustable tilt steering wheel, responsive power steering and wet multi-disc brakes, electric over hydraulic four-wheel drive and rear differential lock, for superior traction over the toughest ground conditions.